While the Scottish Episcopal Church was meeting in the church of SS Andrew and George, Anglicans associated with the Dockyard and Royal Navy had had also been worshipping in Rosyth since the early 20th century, with a church in the Dockyard dedicated to St Andrew. In the mid-60s, HMS Cochrane became a new Naval Barracks, close to the Dockyard and HMS Caledonia. This, together with a large expansion of married quarters, led to HM Treasury agreeing to build two new churches – Church of Scotland and Anglican. It was agreed that the Anglican Church should be built in Hilton Road, a more convenient location, and should have a hall for use by the community, particularly the youth organisations. 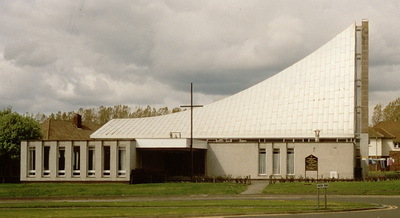 The then Ministry of Public Buildings and Works managed the project (1967-69) and its senior architect, J R Johnston designed the building with a fashionable swept-up roof which caused it to be referred to as, “the church like an upturned boat”, though it was reportedly conceived as a tent of mission for people on a pilgrimage. The building was dedicated as St Margaret’s Anglican Church on 27 May 1969 by the Bishop to the Armed Forces, the Rt Revd John Hughes. Pictures and newspaper cuttings associated with the opening of the new church, from the collection of Martin Rogers, can be found at this link. 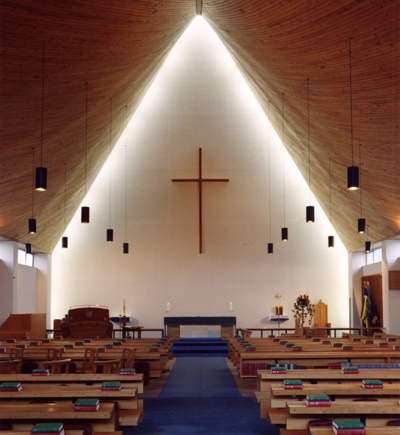 The Church was served by succession of Church of England naval chaplains and a service to mark the Silver Jubilee was held at Pentecost 1994 (22 May). Sadly, one of the effects of the closure of the Naval Base resulted in St Margaret’s closing on 14 January 1996, less than 27 years after it had opened. The building was offered to the Episcopal Diocese of St Andrews, but the offer was declined because of the anticipated high cost of repair and maintenance. The church building still stands and is currently the Sub Station Recording Studio. However, many of the members kept together as a worshipping congregation, and from this our present church grew, as recorded at this link.